I spotted both The Curatorial Conundrum and Olivia Plender, Rise Early, Be Industrious at last weekend’s Offprint art book fair at Tate Modern. The former at both the stand of the Luma Foundation and MIT, the latter at Sternberg‘s. It’s always surprising to finally hold something in your hands after having engaged with it so intensely for often quite a while via a computer screen. On screen everything is backlit and the sense of actual scale, physical weight, the feel and colour and bendiness of the paper, how it actually falls when you open the book, and how the cover relates to the book block, are removed from the actual encounter. Having worked with Douglas Gordon on a book when I worked at Artangel – Feature Film (1999) – I recently did some copy-editing and proofing work on an interesting take on publishing something in relation to one of his most complex works, entitled Pretty much every film and video work from about 1992 until now., owned by the Musée d’art moderne de la ville de Paris. Kay Pallister asked me to have a look at it, as I know Douglas’s practice quite well, having worked on his archive for a while in a long and distant past. An art book about an installation by Douglas Gordon that is by the artist considered as his major work. The catalogue raisonné of a body of work. The catalogue of an exhibition. A game of 101 postcards. A book-installation (that the reader can organize as he or she sees fit). I received an image from it being on press today. After having worked with several ‘mentees’ of the CVAN Creative Writing programme, a quick update with links of texts they have published. The idea of the workshops and the mentoring scheme was that writers based in the North-West of the UK were offered the opportunity to work with a mentor in trying to develop their writing skills and have work published on a variety of platforms. The mentoring involved several skype conversations, and then direct feedback on drafts for a review and a feature-length piece. The participants varied in age and experience – some having just left art school and not published much yet, while others having PhDs, and in some cases an already extensive portfolio of published work. It made me very aware of the fact that writing is such a multi-faceted endeavour, with so many different ways of writing for so many different aims and objectives, something I’d already hinted at in the workshop I did last year (see a previous post). Sara Jaspan wrote a review on the exhibition ‘Real Painting’ at Castlefield in Manchester, which was published by Creative Tourist. Lara Eggleton wrote a review on ‘Assassination, Space Travel & Regeneration: Modern History Volume 1’, curated by Linda Morris at Grundy Art Gallery for The Double Negative. Amy Thomas visited the art festival C-Art 2015 in Carlisle, also published by The Double Negative. It’s been wonderful working with my former colleague Edna van Duyn, de Appel’s long-time editor, again. 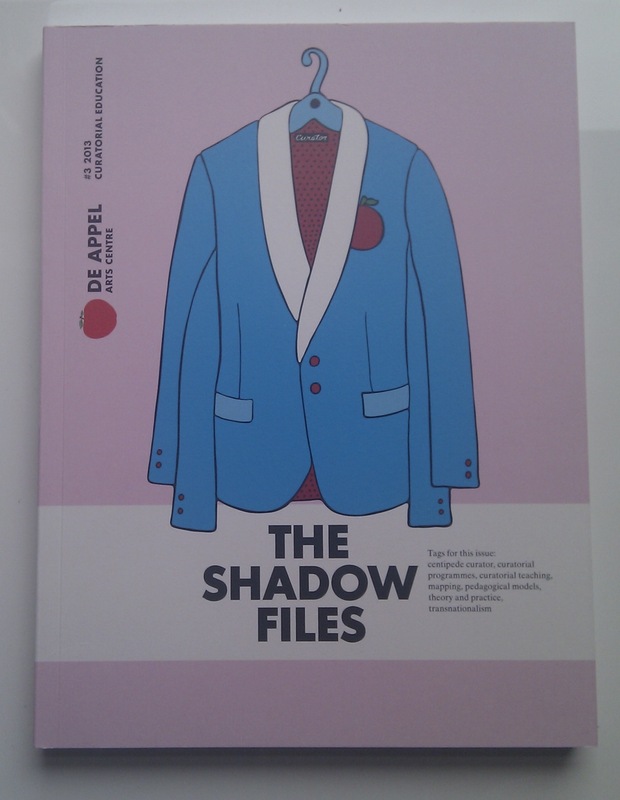 The Shadowfiles is de Appel’s annual magazine in book form that aims to shed light on invisible, behind the scenes activities of de Appel arts centre. While I only translated and copy-edited texts for issues 1 and 2, I’ve stuck my nose into this one a bit more, as the topic is curating education. I was originally hired, by its then director Saskia Bos, to help develop de Appel’s Curatorial Programme (or Curatorial Training Programme as it was originally called) in 1993, and was its coordinator for several years. This issue of The Shadowfiles focuses on the notion of curatorial education – revisiting de Appel arts centre’s Curatorial (training) Programme, started in 1994, in relation to other curatorial education programmes worldwide, and the discourse that is emerging around curatorial education in general. Essays by Mart in Grossmann, Geeta Kapur, Maria Lind, Philippe Pirotte and Simon Sheikh investigate the position of the curator in relation to existing training programmes in different areas of the world. Initiators of early programmes like Saskia Bos, Victoire Dubruel, Viktor Misiano, Teresa Gleadowe and Sarah Lookofsky give insight in the considerations then, now and for the future. A selection of alumni of de Appel’s Curatorial Programme look back on their experience, while an essay by Maria Lind asks critical questions concerning the terminology we use and whether it isn’t time we unpick that further. Edited by Ann Demeester, Edna van Duyn and Hendrik Folkerts (guest editor), designed by Marius Hofstede. 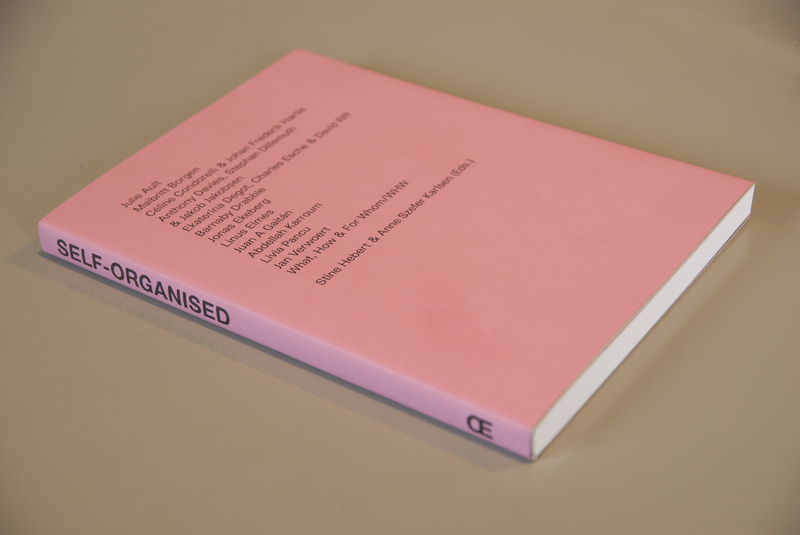 Another new arrival on my doormat this morning: Self-Organised, edited by Stine Hebert & Anne Szefer Karlsen, published by Open Editions / Hordaland Art Centre. I received an email from Anne, whom I didn’t know at the time, while I was at Heathrow, on my way to Istanbul, just before Christmas 2011: whether I’d be interested in copy-editing texts for a book on self-organisation in art, and, if so, could I supply a quote. A couple of days later, after an aborted Istanbul stay due to a sprained ankle, I sent her my estimate. Three months later she emailed me that she and her partner in crime, Stine Hebert, had raised the money to actually go ahead with the book and that texts would be coming my way shortly. For those interested in curating and organisational structures in the visual arts, and alternative approaches to running and managing projects, institutions and organisations, it’s a very good read, and, like other books in the Open Editions series, will no doubt shortly start featuring in syllabi for courses on curating and arts administration. For me it was a wonderful project to work on: Anne and Stine gave me pretty much free reign to work on the texts as I saw fit, which was not only enjoyable but also very rewarding. Some of the texts have given me food for thought, which I’ve in turn used in some of my teaching. The current economic situation and society’s low confidence in its institutions has suddenly demanded that artists become more imaginative in the way that they organise themselves. If labels such as ‘alternative’, ‘non-profit’ and ‘artist-run’ dominated the self-organised art scene that emerged in the late 1990s, the separatist position implied by the use of these terms has been moderated during the intervening years. This new anthology of accounts from the front line includes contributions by artists, as well as their institutional counterparts, that provide a fascinating observation of the art world as matrix of interconnected positions where the balance of power and productivity constantly shifts. With contributions by Julie Ault, Maibritt Borgen, Céline Condorelli & Johan Frederik Hartle, Anthony Davies, Stephan Dillemuth & Jakob Jakobsen, Ekaterina Degot, Charles Esche & David Riff, Barnaby Drabble, Jonas Ekeberg, Linus Elmes, Juan A Gaitán, Abdellah Karroum, Livia Pancu, Jan Verwoert, What, How & For Whom/WHW. Designed by Jonathan Hares.